I'm a cat person. The day the Doctor visits the Planet of the Dogs, that's when I'll be sitting it out and waiting for the next episode, but I'm always happy to see the Catkind, even if they do have a tendency to be benevolently villainous (just like the real thing, truthfully). First seen as a nurse working with the Sisters of Plenitude on New Earth tending to the Face of Boe, Novice Hame was arrested after the Doctor exposed the Sisters' amoral practises. As a penance, she was given the task of staying with the Face of Boe for the rest of her life, and she currently cares for him in the old Senate building in New New York. If you want to get technical, it's New New New New New New New New New New New New New New New York - or, if you prefer, Coruscant, since the Doctor Who effects people made no secret of where they drew inspiration from for the look of the place. 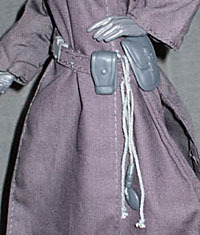 The Doctor has visited New Earth twice, running into Hame both times - as the bio implies, this figure represents her later appearance, when she'd swapped her white outfit for a dark grey one, and started carrying a gun (the traffic is murder - it is a New York, after all). 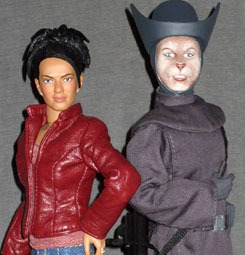 Hame and her fellow 12" figure Martha Jones share the same basic design, a kind of mass-market collector's doll - which is not to say they're cheap in terms of quality. The basic body is the same as Martha's, a fit, generic-figured woman, but Hame's costume hides its shape a lot more than Martha's jeans and jacket. Her head is fully sculpted, including the wimple, and as well as having sculpted glove hands, Hame has a fancy bracelet around her right wrist - a combined communicator/teleporter, I believe, but it's been a while since I saw the episode. Since she's all covered up, the bracelet is the only painted element on her body, but even though it's destined to be hidden by her sleeve most of the time, the paint is clean and crisp. She's a cat, so naturally her face is catty - actually catty, rather than the human-with-a-couple-of-feline-features you generally get when cat people show up. The makeup appliances cover the entire face, which no doubt gave the sculptor a bit of an easy job in replicating the look, but it's quality work nonetheless. There's a subtle fur texture all over, giving way to quite delicate sculpting work on the eyes, nose and mouth - there's no whiskers, which is actually a bit disconcerting, though accurate to the real makeup design. The paintwork is of a pretty good standard, picking out the facial features cleanly with a good colour palette, while giving the fur a gentle shading to define the shape of her face. The overall tone of the fur looks lighter than it did on TV, but I'd mostly put that down to dim lighting in the majority of the episode. And when you take into account the price point of these figures, Hame's face is really quite impressive - as well as replicating the makeup, there's also a lot of character in her face, a mix of worried good intentions and quietly desperate determination. Her head does look a touch big for her body, but that's natural - it's copying an actor's head, plus a headdress, plus prosthetics, so the real thing was a bit bigger than usual too. 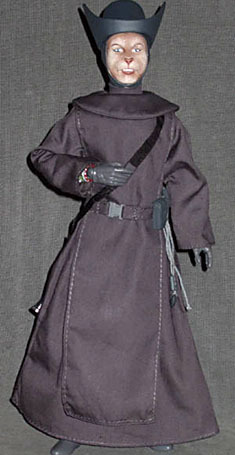 Hame's costume - habit, I suppose - is all one type of cloth, a gunmetal grey that's pretty close to the real thing, though under strong light there's a hint of reflectivity that puts it off a bit. It's a simple design, a robe covered by a sleeveless tabard, with the wimple over the top of that, the neck and shoulders of which are cloth, to which the sculpted headpiece meshes pretty well. Hame comes with the bottom corners of the tabard's front lightly stitched in place, to keep it from getting moved in transit, but it's the work of a moment to cut the thread without doing any damage, and it looks fine unattached. The fabric is fairly middle-of-the-road so far as weight goes - it's not so heavy that it doesn't sit well on the body, but it's sturdy enough to resist reasonable play. Aside from the bracelet, the only other adornment is a belt with a spring clip, two sculpted pouches (solid un-opening pieces) and a few cords, one of which has a symbol attached - something religious, I assume. The belt isn't adjustable, but it sits well around her waist, tight but not so much as to interfere with the look of the costume. Hame has one accessory, her gun, which is shaped like a kind of futuristic shotgun, all body and no stock (maybe there's no recoil to it). 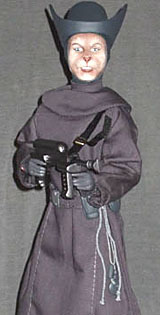 It's a single piece moulded in reflective dark grey plastic, which looks reasonable if unremarkable - the shininess of it helps give it a sense of realism in spite of the lack of paint, though the flat end of the barrel, with no hole or even a black dot to suggest one, is a bit of a drawback when you can see it. Hame's arm articulation is easily up to the task of holding the weapon in both hands, but with both hands having a semi-closed grip, there's nowhere on the gun that the supporting hand really fits - the barrel itself is too narrow, the body of the gun further back too wide, and her thumb isn't quite open enough for her to hold the gun by the ammo clip, tommy gun style. The better alternative is to just sling it over her shoulder - the gun has a shoulder strap, adjustable at both ends. The Character Options 12" body is fairly heavily articulated, though there are a couple of minor issues with Hame that keep her from being her best. As with Martha, the neck balljoint - located at the base of the neck, rather than behind the jaw - has a fairly limited tilt range, though being a proper three-axis ball it can do quite a bit of subtle positioning. She has balljointed shoulders, swivel biceps, double peg elbows, balljoint wrists, a mid-torso balljoint, ball hips, swivel thighs, double peg knees, and swivel ankles. The minor irritation is to do with her legs - without the fairly tight jeans that Martha wore, the leg joints aren't especially tight, and the knees in particular have a tendency to slip if the figure isn't perfectly balanced. The lack of multi-axis joints in the ankles - along with the softish plastic the feet are made from - means that getting Hame to stand up on her own can be a bit of a struggle. In some postures she's fine, but in others - especially with her feet together, facing the same direction - she's pretty easy to tip over forwards or backwards. Not that I dislike her or anything, but Hame's a bit of an odd choice for a figure - granted she's one of the handful of reappearing guest characters in the new Doctor Who (though with no further plans to visit New Earth, her second appearance may have been her last, unless she leaves the planet - a visit to the Catkind's homeworld is in the works), but she's not exactly what you'd call a standout character. It's quite possible that she's here simply because the body had to be made for Martha anyway, so Character Options figured they might as well use it, and picked the best available human-shaped female alien just to give their range a bit of an exotic flavour. That said, she's a good figure - not perfect, with the temperamental legs, but her costume is good, her face is very good, and all in all Doctor Who fans shouldn't be disappointed.